On Friday, we reported about the large-scale operation of International raids launched by the FBI and other law enforcement officials in countries around the world to arrest the targeted customers of a popular Remote Administration Tool (RAT) called ‘Blackshades,’ which is designed to take over the remote control of the infected computers and steal information. The news broke when various announcements on underground forums by hacking group members claimed that FBI especially going after all of them who purchased the hacking tool using PayPal as payment option. Today, the UK's National Crime Agency announced that the raids took place in more than 100 of countries and they have arrested more than 100 people worldwide involved in the purchasing, selling or using the Blackshades malware. More than half million computers in more than dozens of countries were infected by this sophisticated malware that has been sold on underground forums since at least 2010 to several thousands people, which cost between 40 and 100 dollars. The Investigation involved the law enforcement coordination agencies Europol and Eurojust said Monday that authorities raided a total of 359 houses in 13 different European countries, including Austria, Belgium, Britain, Croatia, Denmark, Estonia, Finland, France, Germany, Italy, Moldova, the Netherlands and Switzerland, as well as in the United States, Canada and Chile, and seized cash, firearms, drugs and over 1,100 data storage devices including computers, laptops, mobile phones, routers etc. 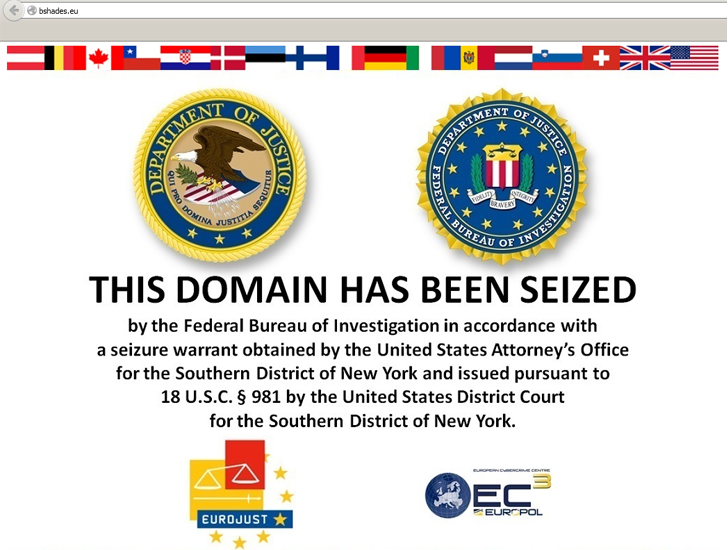 As we reported in previous article, the Blackshades website (http://bshades.eu/) has now been seized by the FBI. ‘Blackshades’ is a remote administration tool (RAT) and is sold legally around the world but bad intention actors are using the tool as a malware for collecting private information of innocent users, including usernames and passwords for email and Web services, instant messaging applications, FTP clients and lots more. In worst cases, the malicious program even allows hackers to take remote control of users’ computer and webcam to take photos or videos without the knowledge of the computer owner. The infected PCs can also be hijacked by the attackers to perform DDoS attacks and other illegal activities without any knowledge of its owner. The program modifies itself in such a way so that it remains elusive for antivirus software. In 2012, while a very serious and bloody internal war between the government and the opposition forces, the BlackShades RAT was also used to infect and Spy on Syrian activists. However, in 2012, a developer of the Blackshades team was reportedly arrested and during same time the source code of the tool was also leaked on the Internet. BlackShades tool was actually developed by an IT surveillance and security-based company, who promoted it as a tool for parents to monitor their Children activities and for finding the cheating partners in relationship. But, as usual every weapon could be used for both purposes, killing and saving lives.